The first week of racing in the Vuelta featured heavy climbing and aggressive breakaways right from the get-go as the riders made their way into the Pyrenees. Cannondale-Drapac announced during the second weekend of the Vuelta that Slipstream Sports, the team’s management company, is seeking additional funding in order to continue in 2018. Despite the disappointing news, #GreenArgyle continues to race hard and rally around the main team objective—a stage win—as racing continues. Many thanks to Dig Deep Coaching’s Philipp Diegner for his contribution to this analysis. Click here to learn more about TrainingPeaks metrics. David Villella was one of the biggest animators of stage 3 as the Vuelta headed into the heart of the Pyrenees, ending in Andorra. Villella’s aggression saw him come away from the stage with the King of the Mountains (KOM) jersey after he fought hard over the stage’s Cat 1 climbs. The aggressive riding began at the drop of the flag as Villella fought hard with a number of other riders to gain an advantage over the peloton. Within the first 10km before the first climb of the day, he hit his peak powers from one minute to 12 minutes. In the first minute of racing Villela produced 526w, 8w/kg, as he exploded out of the bunch. This pain and effort continued in the first 5 minutes of racing he produced 406w, 6.15w/kg. The effort paid off—the early seven-man break had an advantage of 3:44 after only 10 km of racing. The Col de la Perche was the first climb of the day which started only 15 km into the stage. A very consistent effort with little change in power during the climb as the lead group rode together to maintain their advantage, never expanding too much energy. The Coll de la Rabassa, about 100 km into the race, broke up the breakaway and Villela was one of only two riders left as they crested the top of the Rabassa climb. With the gap to a Team Sky-led peloton rapidly falling during the climb, Villella crested the top of the climb in second place, and this was enough to secure him the King of the Mountains classification. Slightly higher effort than the first climb of Col de la Perche: 14w higher average. Most difficult being the first steep sector with 370w, 5.61w/kg for 3:30 minutes. Two spikes in effort: Attacking in middle part of climb with 744w, 12.9w/kg for 10 seconds and sprint for top, where he did 784w, 11.88w/kg for 11 seconds, hitting a max of 1021w, 15.47w/kg. It was a very hot and long day and the break couldn’t survive under the pressure of a charging peloton. Tom Van Asbroeck finished a fantastic third in the bunch sprint at the end of stage 4. 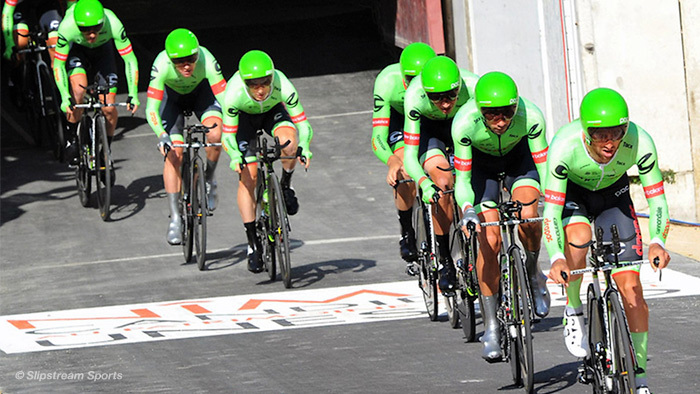 The riders had to race in a soaring temperature of more than 35 degrees Celsius (95 degrees F). With only a few opportunities for sprint finishes in this year’s Vuelta, Van Asbroeck left nothing to chance as he made his way through a fast and aggressive finale. In the final run into the sprint, Van Asbroeck had to make numerous efforts between 650w, 9.15w/kg and 1200w, 16.9w/kg before he even made the final effort for the line. These efforts were needed to maintain his position at the head of a fast moving bunch and with crashes in the bunch coming into the finish, it was even more critical to be out of trouble and close the head of affairs. The peloton averaged 51.5kph in the final 10km and hit a max speed of 75 kph with 4 km to go. In the final 10 km Van Asbroeck averaged 363w, 5.11w/kg for the just 11:30 minutes that it took them to cover the distance. The jostle for position was at its peak with only 1 km to go. Van Asbroeck was positioned well in the top five. From 1 km to go until 300m to go he averaged 357w, 5.03w/kg averaging 47.8kph. This average is not reflective of the effort needed to maintain his position as he negotiated the corners and roundabouts before the final 200m. In this section, Tom hit between 700w and 1000w eight times before the real push for the line even started. Stage 4 saw a super-strong effort by the Belgian all-rounder. Such high power is rarely seen for more than 10 seconds in the final of a Grand Tour stage. The slight downhill finish saw Van Asbroeck hit a max speed of roughly 65 kph, holding a consistent power over the final 200m as he tried to hold a speeding Matteo Trentin (Team Quick-Step Floors) as he blasted his way to a stage win.